Spring has finally arrived in our neck of the woods! 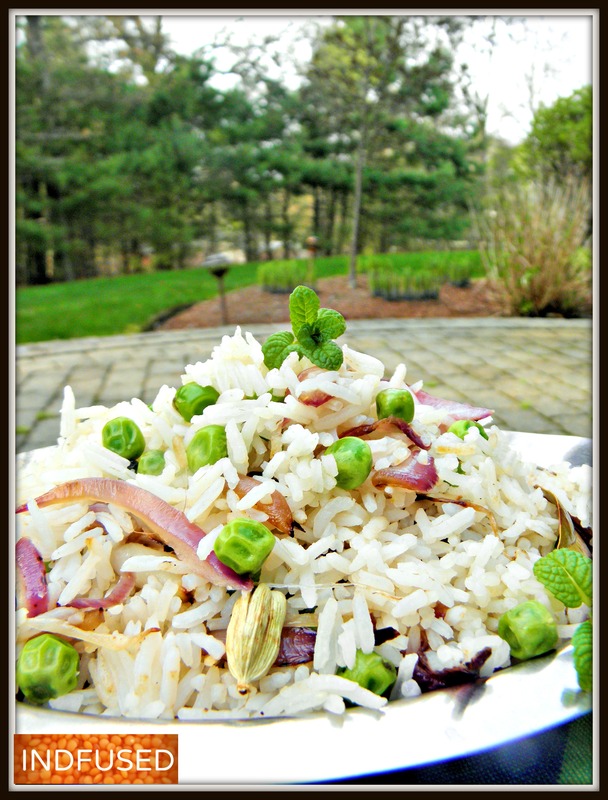 When I saw the mint growing in the yard, it reminded me of this delicately seasoned pullav with green peas and mint. Perfect for spring, plus it is super easy to make. The white rice in this recipe can be substituted with brown rice or quinoa -all delicious choices! I love the fragrance of the Basmati rice and the mint together! This particular pullav goes well with so many main dishes like the Murg Saagwala, the Malvani Chicken,or the Chicken Stew. Heat the oil and ghee over medium heat in a pan. Add the peppercorns, cloves, cinnamon, cardamom and the bay leaf. Fry for a few seconds (stand back as the spices may sputter) and add the sliced onion. Stir fry until the onion begins to caramelize. Add the green peas and stir until the peas are cooked. Turn the heat down to low, add the fresh, chopped, mint leaves, the cooked rice and sea salt to taste. Toss well until the rice heats through and the flavors mingle, about 1 to 2 minutes. I leave the whole spices in the rice. But if you do not want to, remove them before serving. This rice can be made in advance and reheats very well. You may cook the rice with chicken or vegetable stock too. I think I have had this rice many times. Is this a common rice to serve with dinner? I love it and the cardamom is so tasty! yes it is a very common and very easy to make pea pullav. ok I think I had it many times but didn’t know how to make it! This is a recipe that I taught at my cooking class. I have eaten this so many times and love it! Yummm! When I make curry, well I try to make curry, I want to make this rice. I had a very good friend from Bangladesh who taught me several curries which I make to the best of my ability! That is fabulous, Lynn! We all love to learn different cuisines and make them to the best of our abilities and to suit our tastes, right?